Take a bowl. Add ragi flour, wheat flour, salt, cocoa powder, baking soda, sugar and sift it. Add dates, oil, curd, vanilla essence, water and mix it well. Take cupcakes mould and fill it ¾ cup. Bake it for 20-22 minutes till it is done. Check it if toothpick comes out clean or not, otherwise bake it more for a minute or two. Let it cool completely. 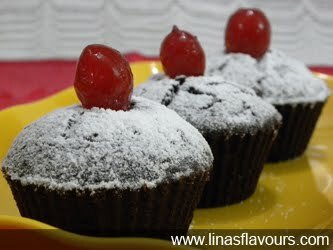 Dust it with powdered sugar and garnish it with a cherry.